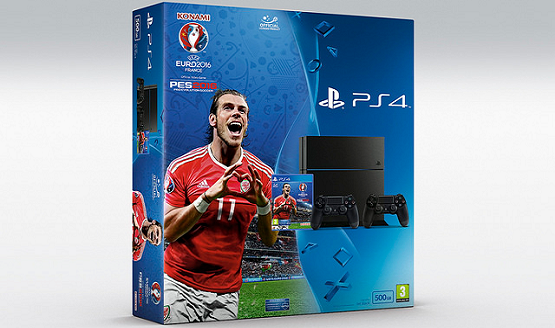 Sony has announced that an exclusive Pro Evolution Soccer UEFA Euro 2016 PlayStation 4 bundle will be available at selected retailers across Europe (availability will vary by country) in early June. The bundle comes with a 500GB console, two black DualShock 4 controllers, and a physical copy of Pro Evolution Soccer 2016 with the downloadable UEFA Euro 2016 cup mode. You can check out the official launch trailer below. Pro Evolution Soccer 2016 released last September to positive reviews. PlayStation LifeStyle’s Mark lauded it for its smooth gameplay and visuals, noting that its strategic elements worked quite well. You can read his review in full here and check out our previous coverage for more on the game. Are any of our readers planning to pick this bundle up?